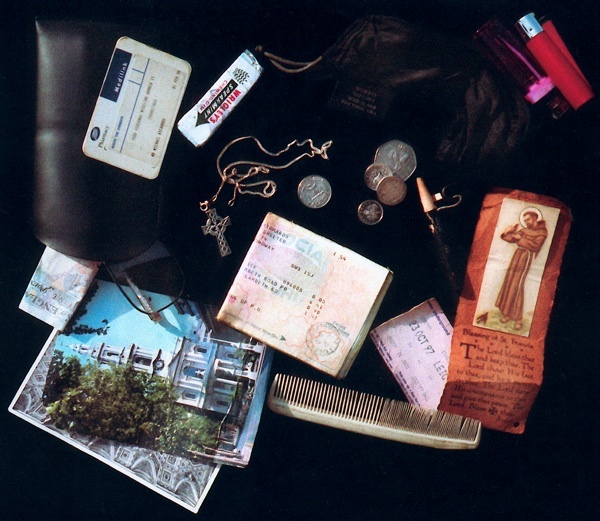 “These are all my worldly goods,” said Darren when he spread out these modest items to show Photographer Moyra Peralta in 1997. 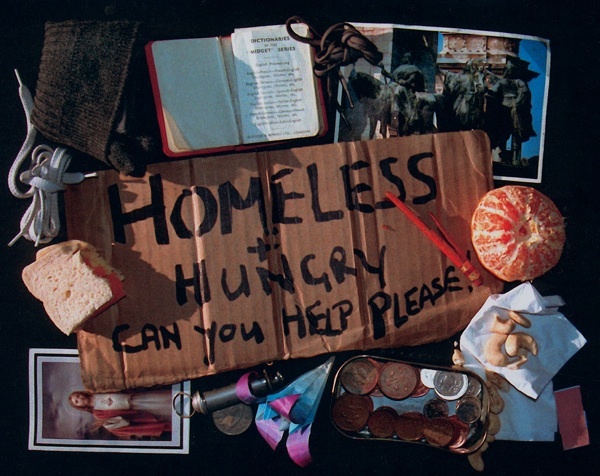 Moyra asked those she had befriended who lived upon the street to permit her to photograph the contents of their pockets and these pictures were the result. Darren (Waterloo) - Dog, dog leads, keys on key-ring, penknife, cigarettes, lighter, matches, loose change, shoppers’ points card, religious medals on a string, prayer printed on a metal plate, photo of a dog, paperclip, safety pins, nine packets of sugar, paper serviette, personal papers, pain-killers, emery board and several plastic change bags. 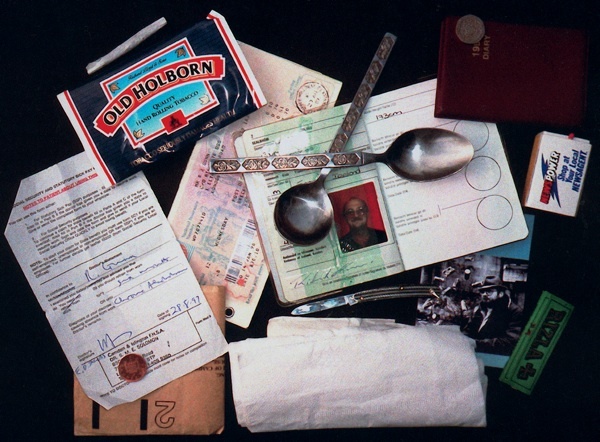 Richard (Holborn) – Busking spoons (for `ham and egg-ing’, ie begging), diary, passport, one roll-up , matches, tobacco, cigarette papers, allowance book, medical prescription, Department of Social Security letter, penknife, photograph, paper tissues, and twenty-one pence. Michael (Covent Garden) – Social Security book, moneybag, a pair of spectacles with case, a religious picture and prayer, a crucifix and chain, a five pound note, London Underground travel ticket, loose change, a US coin, two lighters, a pencil, comb, a chewing gum, a Medilink card and church postcards. 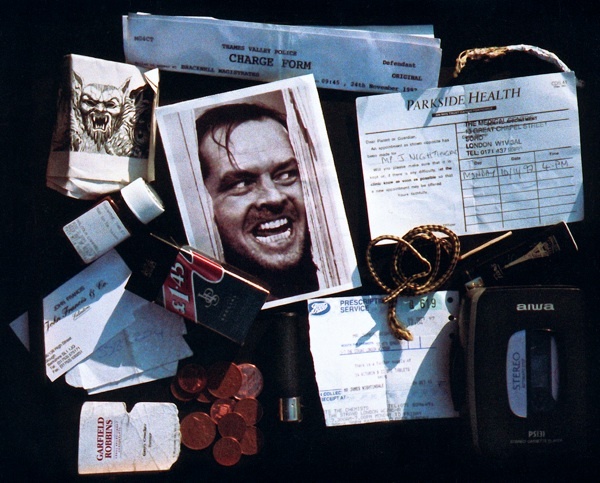 a photograph of Jack Nicholson, a cartoon drawing, copper coins, a match, a wristband and a lucky sprig of heather. 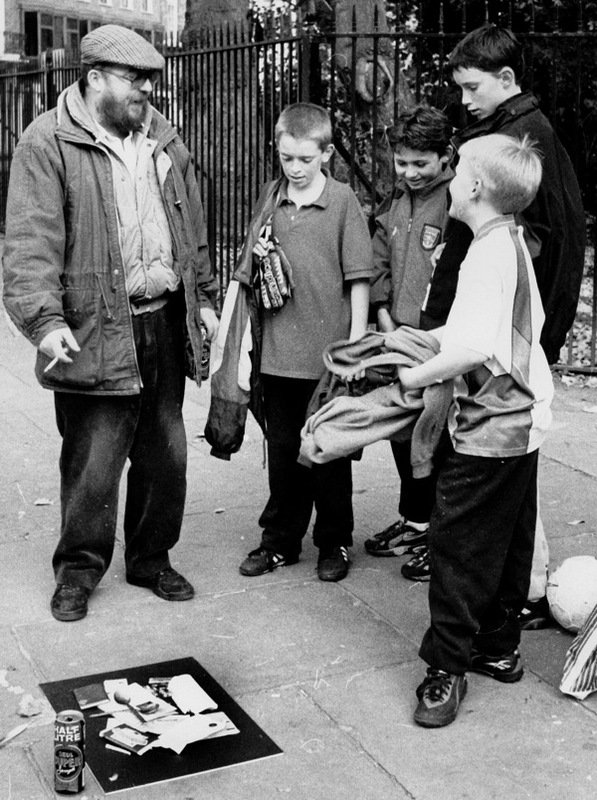 Sean (Covent Garden) – A Begging placard, a peeled orange, money tin, loose change, a paper hankie, cashew nuts, a pair of socks, an origami flower, a pocket dictionary, a postcard, a religious picture, a whistle, shoelaces, a plaster, a broken pencil and an Irish coin. 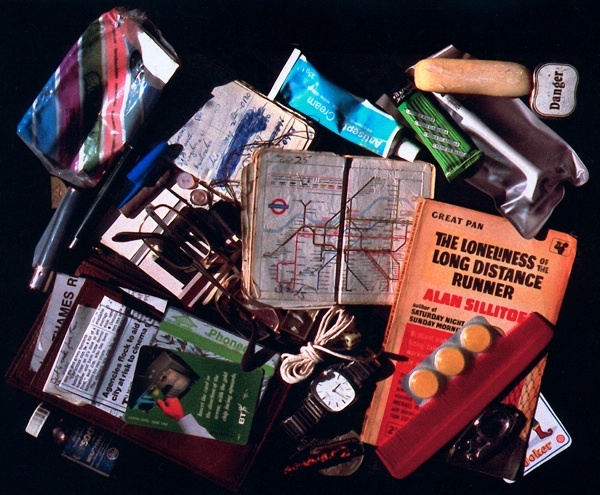 Rory – Virgin Atlantic docket, address book, a miniature elephant mascot, a personal stereo, two paperbacks, `british passport, an inhaler, a brush, two cigarette lighters, a matchbook, a pen, a hammer (for breaking into squats) and a torch (belonging to a friend). 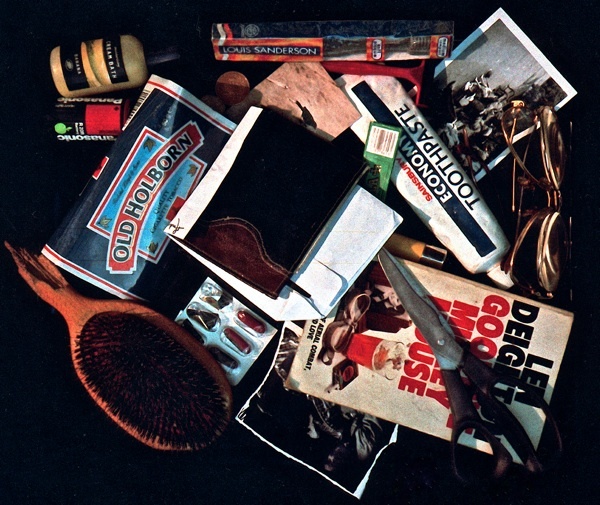 Johnnie (Holborn) – A hairbrush, reading glasses, cigarette papers, tobacco, a lighter, a pair of scissors, a razor, a toothbrush, a toothpaste, vitamin capsules, a wallet, photographs, an envelope with more photographs, batteries, coins, a pen, a paperback and cream bath lotion. 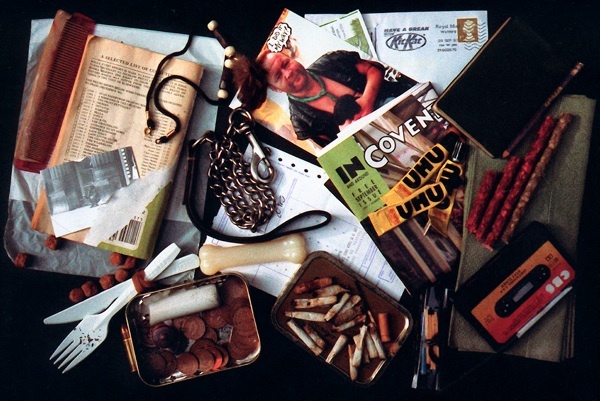 Simon (Holborn) – A tobacco tin, some dog-ends, matches, a candle stub, loose change, paper towels, dog biscuits and bone, a collar and lead, a necklace, combs, a prescription, a notebook, a paperback, two photos, stamps, a copy of In & Around Covent Garden magazine, a cassette, a button, an envelope, a pencil, a bullet, a plastic knife and fork, and three tubes of glue. 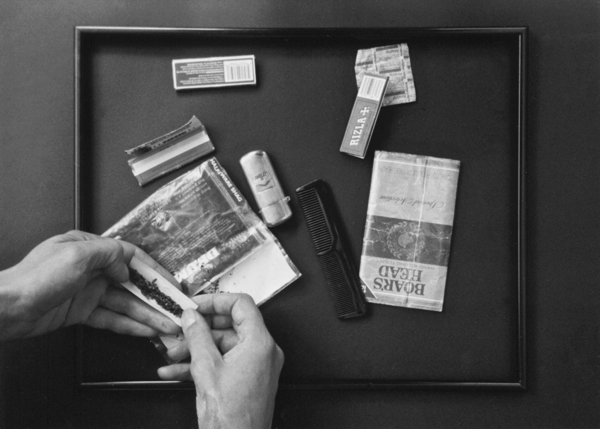 Ray (Strand) – a wallet, a notebook, tissues, an address book, a news cutting, an Outreach contact card, phone cards, dice, a stamp, loose change, combs, a pair of spectacles, a watch, a pen, a playing card, a cigar stub, a pen cap, bottle of mouthwash, matches, buttons, shaving cream, soap, a piece of string, a needle, thread, a safety razor in a plastic case, throat sweets, scissors, antiseptic cream, wire and wire springs and a paperback. 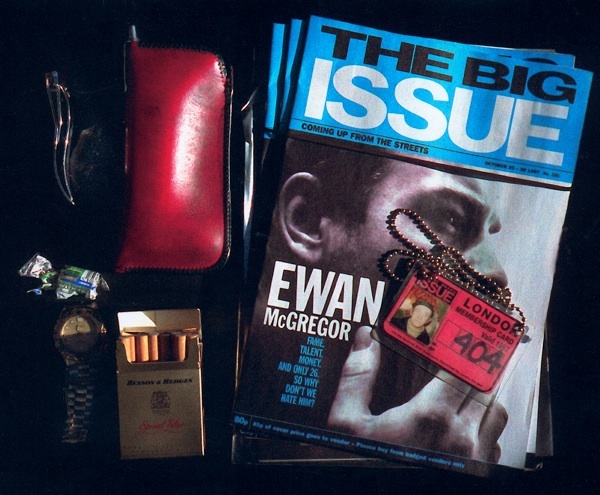 Tommy (Holborn Station) – Copies of The Big Issue, a Vendor’s Identity Card, a spectacle case, cigarettes, peppermints, nail-clippers and a wristwatch. 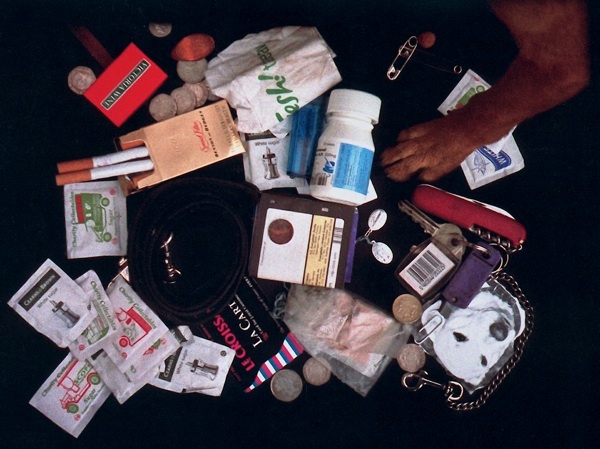 Tony & Sandy - Rolling tobacco, a lighter, cigarette papers, painkillers, a plaster and a comb. 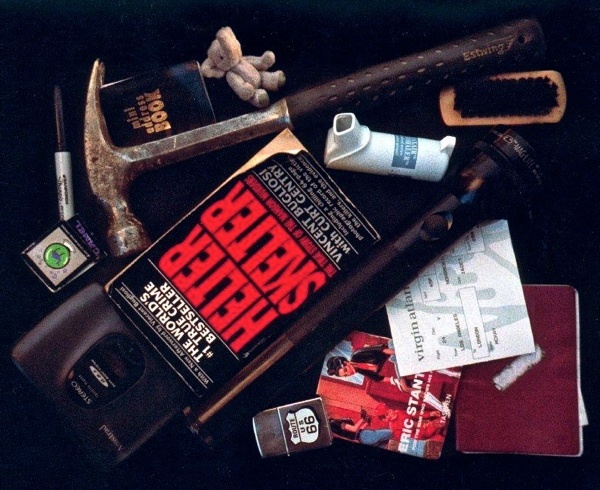 Richard displays his worldly goods in Holborn. Signed copies of ‘NEARLY INVISIBLE,’ including these photographs and more by Moyra Peralta plus writing by John Berger & Alan Bennett, are available for free directly from Moyra for just £2 postage. Email moyra.peralta@zen.co.uk to get your copy. It puts one’s fretting about personal finances into brutal perspective. I was somewhat relieved that the chap who had the photo of Jack Nicholson from The Shining wasn’t the one who owned the hammer.